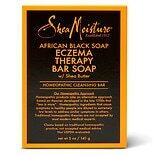 Shop SheaMoisture Eczema & Psoriasis Therapy African Black Soap (5 oz. )5 oz. $579$5 and 79 cents$1.16 / oz. Shop Aveeno Active Naturals Eczema Therapy Hand Cream (2.6 oz. )2.6 oz.